Portrait of the women who returned to live in the exclusion zone around the Chernobyl reactor. Living largely off the land they have managed to stay alive despite the fact that authorities insist that no one and nothing can survive there for long. I really like this film a great deal. However I do have to point out that if you've been following what has happened around the nuclear plant since the accident there isn't a great deal in the way of new information. On the other hand if you know little or nothing this is a great place to start and be brought up to speed. 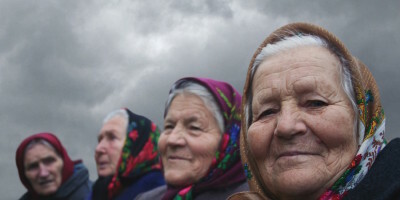 BABUSHKAS OF CHERNOBYL plays tonight and tomorrow at DOC NYC. For tickets and more information go here.